Elementary school students unveiled their award winning educational poster on the deck of Moby’s restaurant in Highlands, NJ. 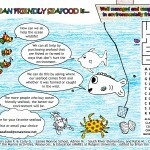 The posters which were translated into educational paper placemats, were intended to encourage kids to learn about sustainable seafood practices and how science can be used in everyday life -including making decisions about the seafood we eat. Included in the design are some great conversations among some swimming fishes about the importance of buying and eating local seafood. The placemat also provides an opportunity for restaurant goers to text COSEE NOW back their vote for their favorite NJ seafood. The winners, who participated in the Marine Activities Resources & Education (MARE) program at Rutgers, showed the event attendees their knowledge of the biology of clams by leading a dissection of some local bay clams. Katie and Luke show everyone how a clam is dissected. 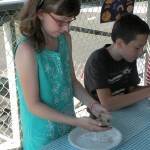 Carli enjoys dissecting a clam on the deck of Moby’s restaurant. 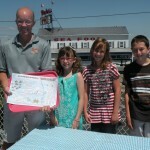 Student contest winners pose with Moby’s restaurant owner Jay Cosgrove. 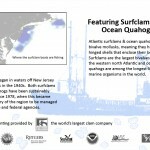 Students artists Luke Fifick and Carli Green (James Monroe Elementary School), Adrian Morelra (South River Elementary) and Katie McDonnell (Cranbury School) developed this educational placemat to help restaurant goers learn about the New Jersey clam fishery. Restaurant goers can flip over the student created side and find more detailed scientific information about the clam fishery. This project was the result of NSF funded broader impact statement on grant# 0909484 with Drs. 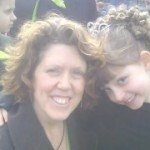 Bonnie McCay, Eric Powell, and Dale Haidvogel. COSEE NOW supported the outreach work with the teachers and students, the production of an Ocean Gazing podcast, and the project website.